Being innovative with Mega Power Additives is key to growing your success. Distributor arrangements come in all sizes. For a business thinking person who thrives on building a business from scratch. He wants its rewards of a feeling of accomplishment and satisfaction produced by small gains every day. He sees his failure to convince others, not as a failures, but as a gardener sees weeds, to be removed to produce the desired crop in his prospects. He understands he is a from a different cut of material compared to others - who see such activity as fruitless, so much dirt to move, while you see it as the start of a vein of gold. Each night he reviews the days efforts looking for weakness to strengthen, and successes as one more step he is reaching his goal to give himself and his family a better life. t sees his effort as a conquerable challenge to meeting his role as a good family provider. s ingenuity. He see it as a public service improving the lives of all who use what he offers. Is for a person who schedules his own time and day. One who sees the problem before him and start setting goes and plans to concur then. He works on the problem and thrives on challenges it presents. and wants compensation for doing so. Realizes repeat business is better than one time business. Likes to be friendly. Is a friend. Realizes there seldom failure or disappointments that can't be turned beneficial. Has no limit for income. He is different from those who want an 8 to 5 job. He feel he can earn more working for himself, though having more challenges. Every day he tries to improve on his purpose to help clents do better. It occurs when you see yourself helping him and others like him grow his business by your help and products helping him produce more daily customer satisfaction and profit using the Mega Power Profit Building Program. He is standing next to one of our servicing tools. This tune repair and lube shop owner has found, what we offer as a business aid can improve his daily customer satisfaction and profit - like no other! This is possible from him using our training and products - explained by you, over that of other programs offered him. 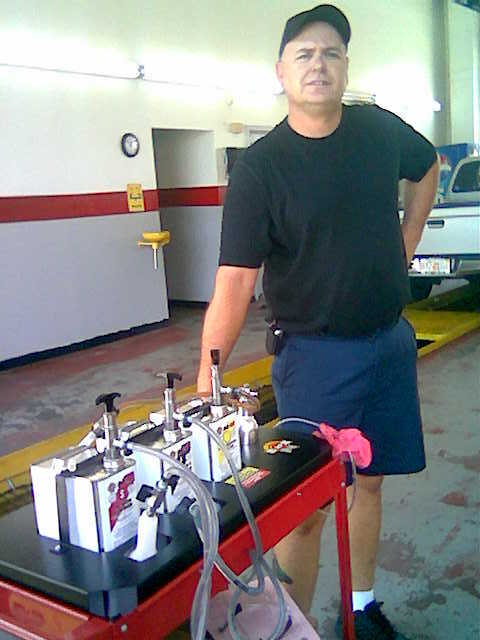 Such improvement to a tune repair and or lube businesses comes when the owner see how you, as our local distributor, offer an interest in helping him grow his business with products and education. This increases his daily customer satisfaction and profit using the Mega Power Profit Building Program. The possibilities for hard word, drive, motivation, and a vision of a better future for you and him. That's the theme here: Can you see yourself helping him and others like him grow his business with more daily customer satisfaction and profit using the Mega Power Profit Building Program? The profit potential is above average for our distributors. That account, typical, produces $100 to $500 monthly income for the distributor. A lifetime income that can provide you with $60,000 to $200,000 income as a rereat customer for you. Multiply that profit by 50 such accounts. Or 100 such accounts and you see what this this Distributor Opportunity Details can produce from a Mega Power Distributor Opportunity Details. The business we are in is to get you up to speed , that hundreds of local repair shop seek out as a vendor. Bot win! A local auto repair shop owner would loved to have a way to produce an extra $50 profit off his customers. this is how that is possible for him - from your effort. Lets say, he has 50 customers during the month. If he could sell what would amount to an extra service he found the car needs, and can have the customer OK that service for $99. And $50 was the resulting extra profit off that sell. Selling just 10 of his 50 customers each month would jump up his months income by $500. Our products and the problems they solve - when explained to the shop owner, now gives him new expertise to take home $500 he never could were it not for you and Mega Power. Customers will like the improvement in their car running as a direct result of Mega Power inclusion. Customer-likes give him and his customers a reasonable confidence Mega Power servicing of the steering radiator, and transmission - other serviceable components, can also provide protection and improved car running operation - rather than the down-hill slide most car owners feel their vehicle is on. Typically, the shop will inventory 5 to 10 engine treatments and about 3 of each of the other component service treatments. Each 10 to 20 day visit by you inventories what missing and you replace what's sold - being given a check or cc to cover what's replaced each visit. You profit is the net part of the process - and repeated each month, by as many accounts as you can open. End More Distributor Opportunity Details. The shop owner is taught to repeat customer experiences as part of his assurance the customer is getting the best around - from him. the shop owner isolates, and explains what he has found, and how this Mega Power Service - price set by your suggestion and the profit involved for the shop. Mega Power solves residue and wear related running problems - in 5 of the cars components -promoting longer trouble-free life for the customer and his car. with 50 accounts like the one just described, producing $100 profit for you, you would earn $60,000 a year. Great tax breaks. freedom of how you control your time. Unlimited potential income. His interest in this product would be because he sees an income potential he can capture with it. It is his means to assure his and his family's financial stability. He would know how many accounts he would need to have to produce $100,000 income annually. He may have a feel for how long it would take. You would be familiar with prospecting, opening accounts and then servicing accounts a regular basis. You would know he is a valuable part of his accounts profit making growth, and lively hood. Fleet owners, automotive lube service, tune up, and repair businesses look for and depend upon vendors to keep them supplied - and encouraged, and are always on the look for new growth opportunities - now rare - but available by you, as a Mega Power Product vendor. Distributor Opportunity Details: Making Financial Growth Possible. Like all businesses gross income and net - net being what is yours after all expenses are paid for, depend on how you see the opportunity. If you feel your offering is the key to the furthered success of many others in reach - your success is assured. That is the confidence our product line gives, and us as distributors have. Each shop can be looked upon as an in reach way to help the shop produce $5000 to $10,000 more income each year from your service to him - he cannot gain in any other way. That shops purchase - what ever it may be means 25% profit for you. As your show nearby business owners our product line and the sales opportunity they open for the shop owner, the shop owner sees Mega Power as a possible new avenue of service-income. While you may not know how to fix cars, what you can convey can indicate you are the new source of profit that can amount to $50,000 to $250,000 for small fleet owners, and the automotive service, tune up, and repair businesses nearby - over the coming years - not otherwise possible for them. All business owners want such opportunity! Rudy is such a shop owner who uses Mega Power for over 15 years - providing the Mega Power Distributor thousands of dollars in repeat income - and of course, Rudy's is profiting off Mega Power too, in a big way - no other product can do for him. More Distributor Opportunity Details. Rudy's. 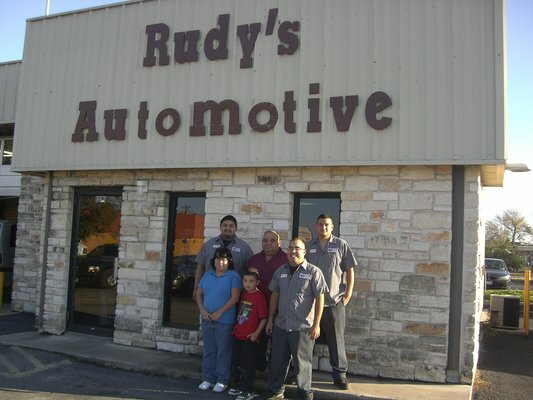 Auto repair shops such as Rudy's install Mega Power to assure an amazing customer experience. A small business selection of one of the inventorying programs produces income for you from that one account of about 200 to 1000 dollars profit each month - $2000 to $10,000 as the account consumes the product and needs his inventory refilled each year - to continue his extra service profit income. The mechanics buying and reselling of your items introduces into his expertise a new a profit expanding and customer loyalty building tool - you are shown to teach him. For your income potential, our Distributor Program introduces the only known way to have a business you can take care of - from your home, needs a small investment, an every month produces ever more income as you gain new clients. How do you open accounts? Distributor Opportunity Details about income production is explained to you here and in detail as you start the business. It is not difficult to learn or do. Like all businesses volume is the name of the game. The Distributor Warehouse Distributor who buys in carloads may cover part or all of a state, or region, and have reps who take orders and fill orders in the field. Other Distributors may buy many pallets of merchandise, but less than carloads, and just cover one or more cities. Sub-Distributors may cover a smaller area and purchase a pallet or more. Sub-Distributors may work under one of the above Distributors. How profit and income is made once you're set up under me. You start by calling on prospects as a Sub Distributor. Profit for you begins when you open accounts. It takes a week or two, depending on your explanation skills to make your first sales. A baby-step method creates small transactions where a client buys a specialty product we have and it improves some secondary work or problem-solving need. Such an introduction is made a great deal for the shop owner. You can resupply him as needed. Other visits introduce new ways for serving vehicles the account is not harnessing now, as an income for you. To open an account may take several conversations over a couple weeks time. They want to hear you will help them in the learning curve. A guarantee is a confidence builder for the buyer. Sales literature helps you break the ice with prospects! How to work your territory. I set a goal to see 10 prospects every day and try to do a demo we teach you and show one each visit. The demo's show quality factors Mega Power has over competitor products. And their usage. This is so the Distributor Opportunity Details a prospect sees when he is buying a superior quality product and a money maker, too! A Product price list, and service price list for him to sell off of is provided. Several other ways are listed here. The Distributor Opportunity Details Way I was shown to open accounts was one to follow one of 3 ways. You have a nice tool the shop owner would love to have and its offered as a gift with their first order. Explain a common car problem, and show them the profit possible with your solution and present a flyer with starting inventory order to select from. Tell them you demonstrating a new service every customer will buy and state the hundreds of dollars of profit it will produce for the shop owner - every month - and that you're set up to restock his inventory so he won't run out and miss some business. Mega Power Profit. Mega Power Products Distributor Opportunity details: Profit Potential. Profit in all businesses vary and ours is 100% more or less. The better type account will buy $2000 to $10,000 from you every month. The average account will buy $500 more or less off you each month. 20 to 200 accounts are desirable. If you have sales people working for you a commission is paid them. The unique income growing advantage with Mega Power. Mega Power Distributor Opportunity Details solves 2 problems and is the reason for its profit making ability. Mega Power Distributor Opportunity Details profit for the account such as: when it is sold to solve over 20 vehicles performance decline problems cause by wear and tear. The prospect has no way of solving those problems without Mega Power. As your account sells Mega Power Products each day, your accounts inventory is consumed and needs to be replace - usually on a monthly route. Details of Mega Power usage. When people need auto engine tune or engine repair the broken parts are replaced by the auto repair shop and the car is returned to the owner. The hidden wear-increasing, power robbing problem is ignored as up until now it could not be corrected - until Mega Power was invented. New parts work with dirty older, friction loaded and residue binding pistons, bearings, valves and gears. There are 6 sub-systems that also become dirty. Those conditions under develop horsepower, as well as consume and waste horsepower as this Distributor Opportunity Details video shows. Wear out rate is twice as fast. Mega Power slams the brakes on that wear out. Mega Power ends those problems. The result is a significant revitalization from Mega Power conditioning. Mega Power ends the power robbing friction and residue problem restore about 10 to 30 horsepower giving a like new driving response back to the car for the owner to enjoy. The WOW effect - advantages he wants to purchase. Besides the actual failure of parts in a car that will get fixed by repair or replacement, every vehicle encounters wear, residue, and friction. It is in this area that the repair shop will profit off Mega Power as the sole best source to end those conditions. Mega Power's uniqueness is that it also revitalizes the car or equipment great running operation again. Filling and satisfying those needs is the opportunity you have with the hundreds of auto repair businesses near you. they are always on the lookout for new products and vendors to supply them to increase their income. Mega Power Products Distributor Opportunity Details: Profit Potential. Our products sell themselves by promised results guaranteed, and our tag line says so with the words: "The proof of Mega Power in the restoring of performance - when nothing else can!" As a distributor those are advantages you show others to use and profit by. You want that in a business, don't you? We cover every popular problem solving need. We research and invent the product to fill the need! Others just buy a common weak ingredient producing poor results and its obvious of such tactics, compared to our guaranteed results! You want that in a business, don't you? Well some depend on publicity to have customers come in asking for a product - which demand stops when the ad stops. Our Distributor Opportunity: the Mega Power Automotive Additive business is not dependent on adverts. Our market grows steadily because we are in touch with the everyday problems we solve. As conditions change, this direct field contact puts our research and development to package items for those new problems. We depend on being on top of the current market need. We lead. We do not follow! You want that in a business, don't you? Attractive looking products: Added to that is a colorful look, and its instructive packaging message. Our attractive looking products go hand in hand with results promised. Together, the results and its package, and its message center on the products problem solving goal. A quick read helps the shop owner and mechanic select the right one for each problem our anti-wear chemistry can solve. Those are supporting values the the shop repair owner needs to grow his income off cars, trucks, and heavy equipment coming in to his business. Your Distributor Opportunity details: the Mega Power Automotive Additive business would be the opening of accounts and then the stocking of their Mega Power inventory in those businesses, monthly. You value to the repair shop owner is not connected to fixing cars. Instead, they will look to you for a steady supply and motivation to keep the owner selling as best he can the services to fill the needs of his customers. Mega Power was invented to correct a vehicles lost performance, by chemically removing negative conditions of residues, worn conditions, and friction, thereby restoring a great running car performance again. The technical part of what Mega Power does is partly covered on this site for your education as a problem ending guide using Mega Power, to do so. The sale of Mega Power to friends and co-workers. as a part time endeavor can put hundreds of dollars income in your hand. The teaching of auto repair shop owners the problem solving advantages will produce many thousands of dollars each month. More Distributor Opportunity Details. Inventory. Keeping $2000 to $10,000 inventory is a good way to have merchandise on hand to take care of part time interest. Higher amounts of product are keep on hand and usually amounts to what's needed for a 30 day inventory. About a 33% to 100% market up is common. Because of fuel, oil, and coolant breakdown, wear and tear, and friction and residues, vehicles encounter running and performance problems that need to end. Some problems are mild, others severe. You're taught to do several demos including this one shown below on friction reducing advantages as a car revitalizes. Mega Power Products prevent, and correct the severest of fuel, oil, and coolant breakdown problems removing friction and residue caused problems - this results in ending the problem. Failed parts need replacement as part of the service. The income part you earn is made helping auto repair shop owners see in Mega Power promotion, more than a profit potential for them. They should see Mega Power adds quality improvement to the repair, the repair of itself is lacking. By understanding wear and tear negatives, the shop owner should be familiar enough with Mega Power Products so they become part of the repair procedure. By stocking an inventory of Mega Power, the shop owner has on hand dozens of situations each day where the use of Mega Power will help them perform a more though service or repair for the car owners long term benefit - and produce extra income, not possible before. In my case, auto repair shop owners will purchase from $500 to $1500 a month for use to cover the services they sell and need Mega Power for. From 1/3 or more is Distributor profit in my case. I believe that is average. Mega Power Products cover each of those areas and makes for the Distributor Business Opportunity Details Profit Potential. Mike Harris, a Distributor under me I'm helping says, "George is showing me how to attract people with such problems - and show them - what I call little teaching demo's, that has them buying hundreds of dollars of Mega Power off me. I'm making a repeat profit right off the bat - including the helping of 2 mechanics, so far - who ordered over $500 of Mega Power, with a promise that I would keep them restocked every few weeks. $500 for me produced $200+ profit with just a few hours time. And more profit occurs as those account need more product each month. George has widen his profit making expertise to help me - and that is his plan for you. Give it a try! Its easier to make repeat income than I expected in this way." Mike Harris. Here's the point. If you're friendly and helpful, you'll quickly pick up the talk that's needed to acquaint others of your desire to help them learn of new exciting ways to grow their income. They are the techs. You're just passing on what works they need to know about. Friction growth, and residues causes dozens of problems in every type vehicle known - that creates performance problems. The unique features and advantages of Mega Power uniquely ends. And ending them the Mega Power ways restores the units former like-new performance - no other product can! You'll learn many ways to demo Mega Power using each demo to make a point 10,000 words cannot. That demo will be eye opening as a new money maker for the mechanic. "This demo - shown on this video, will soon be added to my faster, more profitable producing skills." See what Mike is about to add to his profit increasing you can add, also. For you - The Mega Power Products Distributor Opportunity, Profit Potential includes as prospects, every fleet owner, every auto mechanic shop, and every vehicle type. That is a huge market that never will be peaked - and is one more great income making advantage you gain with Mega Power. Other unique advantages in this market you as a Mega Power Products Distributor Opportunity Details may take a profitable advantage of. Competitors "may" have one good product - and all others in the line are below average, and the main product carries the weight of their no-good products. Once bought, they are worthless and so never sold and sit on the shelf of the mechanics shop. We'll show you this fact and how to also profit of that competitor weakness! However, Mega Power has dozens of products - and they can be shown to be the best that's possible in each of their classes, and can stand as "number one in that class!" That is a great marketing product value that expands your selling power. This negatives in all vehicles and Mega Power's ability to profitably end them is what turns prospect into clients and ongoing profit makers for you. "Residues" and "friction" lowers horsepower development causing over 20 running, tuneup, shifting, and cooling problems - and just one of them is enough to show something is not right deep inside the vehicle. The need for help has arisen. Mega Power removes these residues at the cause of the problem no other problem can - to end it! Residues causes as much as one horsepower out of ten to not develop. Mega Power restores the missing horsepower problem, and it is at first hidden. Mega Power's chemical Hi-tech and complex problem solving formula. Including friction modifiers that changes fast-wearing, power absorbing, friction roughen surfaces to smooth, again. Those beneficial conditioning factors on your cars pistons, bearings, cams, gears and shafts work as if new. This uniqueness allows once-stolen and reduced horsepower to appear again to spin your car down the highway faster on a bit less fuel. That is what people want to buy in a tune up and repair or servicing to end their trouble with. That is a few of many of the Mega Power Products Distributor Opportunity, profit potential advantages we teach you to show that claims of such by competitor products are false - while yours fill a real profit making need. The proof is in the performance - we have it - no one else does! Not to brag, but to point out what you might want to consider. You want to be on the Mega power side of any proof offering - because the other brands have none! Prospects need to know who is the best for them! Fuel, oil, and coolant breakdown and growth of friction also cause acids to form which eat away the shinny smooth metal pistons, bearings, valves, and gears surfaces, and causes gaskets to leak. And sludge causes those valve tapping and noisy operation problems. Those rough idles, burning of engine oil, rough shift, gear whine, growl and such, negatives. Mega Power Products ends those problems. As years of high engine, transmission and other component temperatures, the breakdown fuel and oil and coolants become more pronounced. That upsets the normal - causing vehicle problems the owners seek a remedy for. The Mega Power Products Distributor Opportunity covers preventive anti-wear servicing required by the owners car manual. And, problem solving profit potentials. Mega Power is </B>a top quality product line with those problem-solving and very unique selling and buying advantages that will build you a growing financial income. Find out now, by calling me to see if your local area is open. If open, ask to find out more on getting started. My financial growth story with Mega Power Products Distributor Opportunity can be your story, too! I would say, Mega Power More than doubled my average income. Each month, upon visiting each account. and your inventory system, will show you what's missing that has been sold, and needs restocking. If averaged, each account would have a lifetime value $15,000 profit to me - and you! That means that over the years, that would be my total lifetime income from each account. As for the repair shop owner, he continues to buy Mega Power monthly from you to keep his inventory up to meet the daily occurrences where Mega Power fits into his need to profit off services to correct wear and residue performance caused problems - every car in his shop has! That is what I love. Knowing I profitably fill the need of mechanic to make more income with Mega Power, and give the car owner years more dependable service - because of mega Power. Does that appeal to you? if so, read on to have your questions answered! Then call me for more details... ok.
Mega Power Products Distributor Opportunity. How do you obtain accounts? You begin your sells story in a friendly casual way. You talk of news of what new for profit making, to likely prospects as "Mega Power advantages for the automotive repair and service business owner - to start growing his income. He would like to increase his income by $10,000 or more each year!" explaining to the shop owner that each car has problems now are now overlooked and that until Mega Power came along - was missing to help the customers car end hidden problems - that worried customers. You explain, the customer would gladly pay to have their wear and tear condition remedied, if only someone could do so, that is cheaper than letting the wear problem continue speeding up the cars early demise and need for costly car replacement, as the remedy. By showing Mega Power's superior-to-anyone else's problem solving advantages, shop owner's will want Mega Power on inventory to cover previously missed sales opportunities - and that can increase his take home profit by $500 to $2500 a month. Several appealing demonstrations that show the money making advantages to the mechanic, followed by a starter program, you'll show the shop owner, makes the sales for you. The shop owners customers want performance restoring services and stay loyal to what works. That is your selling model. While in popular brands of most anything, one item is the sole leader, while Mega power has a dozen such - and each one can stand along as the best in the market place. These gives the shop owner a new expertise to restore what wear and tear robs the vehicle, and return a like-new feel, zip, and dependability all other additive products are not able to give. With your Mega Power Products Distributor Opportunity, and Mega Power, the shop owner is selling the very best. Those are key features to provide you a growing income potential. Why not call now to see how to set up a distributor business in your area. To ask a question, or to order Mega Power Products. Mega Power Products Distributor Opportunity Details. When you have a car problem you go to a specialist. The specialist wants to earn all the possible income off each customer - and establish a repeat income by means of customer loyalty. He does so by filling a need the regular doctor cannot. Mega Power fills those needs for the repair shop owner. They are what will help you open new accounts and produce a strong friendly repeat customer clientele. After a discussion with an auto repair owner, the owner will want the profit improving Mega Power advantages. He'll select from several programs covering the types of service he wants to add to his expertise. You follow the set up and inventory control to keep him supplied for 2 weeks to a month intervals. Act Now! Call us while on your mind! What happens after you get you first customer? When the account selects Mega Power products to fill their customer's car care needs - doing so, by installing Mega Power to correct the customers friction and residue problems. Their inventory goes down. At a scheduled time you return, replace missing products sold and installed. give a sales commendation. Give him the bill for today's refill. remind him to call you anytime. Go to next on your route list. This can be and are in various parts of their customers cars - or, they use Mega Power as part of a car system service every car needs every 2 years. In that case, their Mega Power inventoried products are needed to perform the service. A place is set up for Mega Power so its easy to see and get to for the account. Sometimes I sell them a shelving product. They agree to the stocking inventory level- - made from 4 choices you offer them. A record sheet of this and pricing is set up for your file route book. Each month, I bring a new flyer to help sell Mega Power. Do their post card, email set up. Show and educational demo I picked up. Check the record against what's missing. Restock those items and note it on that lines info. The best part: Collect a check. How your accounts work and sell Mega Power. Your Mega Power re-seller will have many opportunities each month to sell a service where Mega Power is the unique product needed. Each car and heavy equipment has 6 areas for additional sales of services customers want and needs. And Mega Power covers them to the widest extent possible no other brand of additive offers. There are over 25 specific problems Mega Power covers that a car needs helps with - to run better, or to restore its best performance again. Those are a few of the common ways your account uses and depends on Mega Power to satisfy his customers and profit off that expertise. My accounts see Mega Power and me as a business success aid, and look forward to me coming as a friend, and vendor, on a prearranged monthly scheduled, to replace their sold Mega Power merchandise. A cash and carry business. As a Mega Power Distributor, you have for yourself and your customer clients an unlimited income opportunity. That Mega Power marketing benefit is what provides new accounts who spend $500 to $1000 a month with you. Mega Power provide a new source of revenue for you. It amounts to what ever new account making ability you produce. it will produce $500 to $2500 new profit, at no new expense for your client customers. And much more each day for you - maybe. And to repeat it every month, each month. How Mega Power expands your income. Mechanics, and Auto Repair Business Owners will have a new up sell of their services customers. This amounts to $500 to $3500 extra monthly income for the shop owner - not possible for him by any other competitive means or product, except with Mega Power. The ability for the business owners to offer their customers a much better way to maintain their cars, by having them serviced with Mega Power. Mega Power helps the car owner end their car's common power deterring, performance losing, hidden conditions - in 5 car serving areas. With Mega Power, car owners see the means to help their older cars last years longer - an opinion they form after seeing friction and wear power robbing negatives disappear. It is those Mega Power advantages that will make for a loyal, repeatable monthly business opportunity for you - as a Mega Power Distributor. Growth occurs as your clients business experience grows, and the profit angle grows. And as new accounts want Mega Power, you profit volume grows. With Mega Power you can service 6 car areas: motor, transmission, radiator, power steering, A/c system. Those who service and repair cars, trucks, tractors, heavy equipment, boats, motorcycles, and many industrial machines. This unique marketing advantage gives you a lifetime of employment with a strong, more productive future. Look around your home area. Look at all the cars. Think of all the things that go wrong with them, caused by friction and sticky residues - Mega Power will end. That is your opportunity. Mega Power makes it possible. As you learn and grow promoting Mega Power so will your income. There are no better, easier way to makes a living - and none as creative as this one. Call me now, and say: I'm interested in getting started with Mega Power as one of the above. How much do I need$ and what are the first steps to get started? The market for Mega Power are owners of auto service and repair businesses who find Mega Power the best product around to increase their repair and servicing expertise and income. That is a huge market. Mega Power is an upgrade servicing product helping fleet owners extend the time by many years between costly overhauls. Those that practice cost-per-mile accounting can see Mega Power Advantages. That is a huge market. Car and equipment owners need Mega Power to prevent costly and avoidable overhauls. For them, Mega Power stops the speed-up of wear out years prematurely. That is a huge market. The answers to several questions helps prospect determine if a need exist and likely customer benefits will show customers it cost more not to have Mega Power included with their service or repair. By spending full time at first talking to each prospect, explaining the Mega Power potential income possibilities you will get a hearing ear from each prospect. You may be wondering:</B><ul><li> What is this Distributor Opportunity, and the company offering that’s really unique? That is, Why should I pick up the phone and investigate this offer? "What do I have to do to make the money" - is another way of putting it? You just seen a few of the desirable Mega Power Products Distributor Opportunity advantages that will help the many mechanics in your area increase their tune up and repair skills and income. What mechanic is not interested in quality work, and more income? They all are! Mega Power is sold by the mechanic to their customers as part of the service or repair the customer brings the car in for. For example, I teach the mechanic to add $95 for Mega Power to the estimate for tune up or repair cleaning and conditioning since the motor or transmission is probably full of sticky rings and valves with this mileage on it. When reviewing the total of the customer's estimate, the mechanic points out "Mega Power is for cleaning the rings and valves, fuel injectors, sensors, and catalytic converter. Hand cleaning all that would be $500. MP does more and adds power improving advantages just cleaning cannot do. Their car will run good as new again as every part slides on anti-friction to help slide and roll on a slippery film. It will give more years of good service. Every car gets this service its that important." On the Mega Power Service, they earn $50 to $150 extra. On those cars where Mega Power is installed more servicing will be picked up as this is part of the needed service the customer appreciates. 10 cars on MP will add $500 to $1500 profit to the mechanic's monthly income. Mega Power makes that possible. Once the mechanic learns to follow the MP script and sees favorable customer feedback, they will order $500 MP from you every month. With 100 such customers, you will earn for yourself $5000 to $10,000 a month. That is worth working for. Distributor set up cost runs $12,000 to $25,000 for product. More ways to look at the possibilities with MP. Right now, here's how your Distributor Opportunity income part starts, and grows. Lets suppose your Mega Power income goal was to produce enough sales to earn $100,000 profit this next year. There is no top limit. <li>This is for illustrations purposes - and not a guarantee or promise. It should not be unreasonable to earn $100,000 in a year with a Mega Power Distributor Opportunity. That amount breaks-down to $2,000 a week income or - $400 a day average profit. We will start by reviewing what could be an average account - Joe's garage. Let's say you called on Joe, who became a customer, an average product user. Joe's garage uses about 3 cases of our product every month - Joe pays about $500 for 3 cases of different products he needs. You deliver them to him. He writes you a check. This is mostly a COD business. For Joe to produce new or additional business that would help Joe earn $500 to $1000 additional income each month, he needs at least that much product from you. Your gross profit off Joe that day is $200. Over a span of 5 years, Joe's account can produce an income for of over $10,000 for you. This is the potential of each account. They need vendors to help them be a success, and you would be doing one of the great deeds by helping them. If the average income from all accounts amounted to $200 per account, per month? It takes about 3 hours to establish an account. It takes about 1 to 2 hours to service, and provide encouragement and help work ut a sales plan for them each month. There are banners and literature for this. I've service 5 accounts dayin day out, and prospected for 5. That is what you do like its a garden. you weed, wate3r fertilize, and harvest - if you please. Many distributors have well over 100 good accounts and another 100 so-so ones. I think you can do the same - with Mega Power's see, hear, and feel characteristic that make cars suddenly run like they have a bigger motor. Mechanics and people are continuously impressed with that! Can you see, all together, do you feel they can become a powerfully creative marketing advantage for you? You introduce yourself as, "with a company that helps businesses like theirs earn an extra $1000 income, by showing the owner a simple method that gets customers to order services you can give a way now. They say what is it. That is not important as this information. Read it over a couple times, let your wife read it, then we can explain how this simple method, will help you produce $12000 more income this year. $50,000 you would never have made, over the next 5 years. Your family needs that extra money, and we'll show you how to earn. See you in a couple days." Like any business where quality must be shown, your training includes the difference between what Mega Power has compared to competitor products. The Mega Power Distributor Opportunity Details includes over 2 dozen top quality products that provide repeat sales - that is key in all this. Once this is made clear in your mind,, you will be on a mission to show prospects a new way to produce good extra income they can't in any other way. That is your value to them. Your accounts, and your value to them. Joe's garage, if typical, Will earn maybe, $60,000 extra income during the 3-6 years - he never could have, as a result of his putting your Mega Power suggestions to test. The products have a great virtue to help you and Joe show the customer, Joe knows really how to make cars run better than any one else. Joe depends on you for Mega Power. Eventually, Joe will purchase more of the product line as he sees they cannot be beat. No other Distributor Opportunity can do what is possible with Mega Power for you, and the Joe mechanic shop owners near by. It makes believers out of you and them! Joe quickly learns, Mega Power are special products - that they are good for him, his customers, his ability to produce extra income. Hey, I'm not saying this is a piece of cake - right off the bat. No! Here is your first Distributor problem you will encounter. It will pass. At the first, you are the new kid on the block selling - not proven worthy yet. You know what I mean. So, the first garage has to take a chance and try Mega Power, as you showed him too. You will find that 1st customer. And his favorable results produces reorders - this is what will supercharge you confidence. it proves you have what they really need. Then, certain vibes will emanate as you talk to prospects, that they too should test you out. You want them to test Mega Power. That's the way this Distributor Opportunity Details begins. That is the first hurdle. Mega Power will never let you down! My Joe mechanic customers tells me a story about how the product impressed the customers. I found, in the first few weeks of door knocking, such a story like that, increased my ability to open new accounts - as I related how other joe's - down the street, had great success with Mega Power. I pass those stories around like fertilizer to prospects, letting them know what my products and me do for the other Joe's. That story - and the extra profit making ability they produce win more accounts to try an initial order of $500 to $1000. I throw a couple days of demos to their customers to help get the momentum going. About your customers, new Mega Power potential, to add $1000 additional income to their monthly average. We show you how that works so you can convey - your not selling, your helping them make more $! Competing products, oh yea, there's lots of them. But, we're the Rolls Royce of additives - see, it says so on my business card. Side by side comparisons prove we are the best. You are taught this! My "Joe' customers" are a valuable, precious resource for me. I'm willing to help Joe prosper and to help insure his success - to insure mined. These special products and me do that for lots of Joe's garages. That sums up the Unique Distributor Opportunity we offer and is what shows what is needed to earn $100,000 a year income. Why don't you give me a call and let me answer your questions about all this. That is what I'm here for. I'm George Christ My cell is 512 665 3388. I will help you in an ongoing way to master what you need to grow your income, in your area. This type Distributor Opportunity Details the business an 8 to 5 job cannot. I've spend a lot of time involved in charity work that - time wise, is more rewarding. I also spend 2 months a year visiting relatives and my kids and grand kids, and going places and doing things in a family way with them. Mega Power is the opportunity I found that gives me that freedom. I believe this Distributor Opportunity Details is a very valuable consideration that's unique for such a lifestyle. To me, what good is an extra a pile of money in my bank account if I miss-out on my charity work, and family personal help, and loving. I see their life is much easier with such help. I think they need that help more than what things given, can provide. They may have a happier life because of it. That can't hurt. But not being around as parents and grandparents and guardians of their mental and physical health could be, I believe. My Mega Power Distributor Opportunity Details that possibility. If my need for $ is greater, I go out and look for more Joe's to teach what my products can do to help them, and pledge my helping to add to their success - so, I help myself, too. Pick up the phone and call my cell 512 665 3388. Lets see if this will work for you! I'm george christ. I'll try to detail it out all best I can, to past on why it works for me, to help you see if the mentality required for success in this business, matches your ideals. Show what you must expend to gain the potential income opened by it. We offer a unique business opportunity with these features: A Distributor Opportunity: Detailing Automotive additives and their training usage info. It offers a low investment. A high return on investment. Distributors with this company enjoy a rare price structure from the manufacturer. They enjoy the benefits of a broad range of highly profitable, specific products - each filling a specific need - all vehicles require. An arrangement from factory to retailer like this is called vertical marketing Distributor Opportunity. This is not not MLM. This company is not by a hard-nosed, out of reach, goal-pushing company. We have goals. One of them is to encourage, and help you excel in your own style. That's it! We gladly fill in the blanks – on an ongoing basis; so you have what you need to succeed – not what we need to succeed. This, Distributor Opportunity Details show an excellent product line that supports any income amount your willing to work for, grow into. Our product advantages help to bring out in our distributors the qualities of persistence, determination, and a bit of friendly flair. That is what is needed. Are those qualities you enjoy, and that spur you on</B> to help you excel? If so, we invite you to investigate this business and its potential. It may be just what you’re looking for. Call us to learn more about our products, their unique advantages, and your qualities of persistence, determination, and friendly flair can help you as a distributor, succeed. If you’re that way, I believe those who will become your customers - will have a hard working disposition like you have, and they buy from people who think like that, too. Income? $100,000? Higher, if you want - less if you aren't that good. The potential can give you the drive and desire to go many times that. This is a business opportunity with income growth, unlimited. It is ideal for the individual with requiring an above average income - and working hard and smart does not bother them in that pursuit. Investment for this Distributor Opportunity Details are...Invest up to about $25k – usually. Of course, you can come on board as a sales rep under a Distributor. Distributors become your suppliers if you are not a direct Distributor. We offer a buy-back guarantee. And you may have ability to sale your business for a profit, afterward. There is no soliciting of your friends to go to ra-ra meetings to get them to sign up under you. All accounts you find and develop under you are your customers, your business. We are suppliers of the product. You don’t have to depend on friends of superstar talent to find other superstars, before you make a dime. This is for a man or women whose nature is friendly, outgoing, but of a business-acumen nature. You would be the type of person whose livelihood and motivation to make a success of a job or business is to-keep-working-the numbers and small goals every day - mentioned above. Call me now, if you are better suited to work the freedom, excitement, and income potential that the field of selling, and of being a distributor provides. Give me a call, lets see what you have, and if this is for you. I'm George Christ. Factory Rep for Mega Power. My cell is 512 665 3388. Call any day or evening. Questions, about a Distributor Opportunity, to ask your self. Does selling a product wholesale to customers each month match your preference as a desirable means of self employment? Does having a no-limits on weekly income motivate you to work harder? Is this one aspect you're looking for in a business opportunity? Is selling to nearby clientele also a plus? You would be a small business owner, providing products to help other small businesses profit and succeed. This is ideal for you if answers to the above are yes. Are you a learn as you go type? Are you self motivated? If so, come on board. Are you the type with a winning, stick-to-it stamina. Do you believe the law of averages works in your favor. Do you possess a can-do attitude. Those qualities work well with this Distributor Opportunity. The fact business is slow - means, it will be until you master getting to the real need of your prospect. Your willingness to try again – if you know they will buy, if they know what Mega Power can do for them and their customers, and the profit improvement is your point. You both will appreciate and benefit from your efforts and our products - once the point is understood. About your ideals and work ethic and beliefs on all this. Do you believe that to succeed, you must have a product you can believe in? If its the best for your customers – and you can prove it? Do you want a product that is superior? One you can willingly challenge competitors with, to prove your products worth, over theirs? That is true selling in our field. Can you stand for your hard earned ideals being insulted? Because they don't think they need your help? We keep trying. Persistence pays. That is more so true of us, our products, this Distributor Opportunity. I believe you must have the best interest of your prospect and customer at heart. What you do is for their greater success, not yours? Yours is a result of the success you provide others with! Our product line is one that provides such results. Interested, call and discuss with me what fears you need addressed, what desires, and investment goals you need to have, and to learn of the details of why this may, or not be a good business opportunity for you. That is fair to you and me - and gives both the answer we need. To learn more about Mega Power Products, this Distributor Opportunity, and the options available as a Distributor, or salesperson, call me now. I'm George Christ. My cell# is 512 665 3388.